If you saw The Avengers then you know why Shawarma recipes have been popping up on blogs everywhere. But you don’t need to have seen the movie to enjoy this recipe. I’m not going to even try to say my recipe is authentic, but it is pretty tasty. I looked at several different recipes and came up with one that is SCD friendly. Shawarma can be made with chicken, beef, or pork. I chose chicken, because I don’t eat a lot of beef and pretty much no pork. I think you could also use lamb or veal, but I never eat those. In a large bowl, combine all ingredients for the Schawarma except chicken. Mix well. Place chicken breast in bowl and cover completely with the sauce. Marinate 6 – 8 hours or overnight. Grill over medium heat (I used an electric grill) for 5 – 7 minutes per side, or until cooked through – cooking time will depend on thickness of chicken. Really thin chicken breast may only take 3 or 4 minutes per side. Cut thin slices of the chicken breast. Place sesame seeds and olive oil in food processor. Process until it forms a paste (add a little more oil if needed). Add the rest of the ingredients. Process until smooth. If sauce is too thick, add a little more lemon juice. 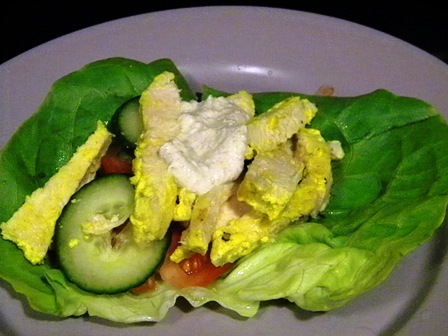 Place chicken, tomato, and cucumbers in lettuce leaves. Top with sauce and wrap. This recipe looks terrific… I find your blog very interesting. Please share this recipe on my foodie friday party today. Thanks! Sorry I didn’t see your comment in time to share…next time for sure!